In my late twenties, I interviewed for a creative position at an ad agency. The hiring manager asked me to name three dead people I would invite to a dinner party. I did okay with Shakespeare and Abraham Lincoln, but apparently the third person I named, a journalist, was still alive (although he had to be really old, or at least seemed really old—dead, in fact—to a twenty-something). I didn’t get the job offer. But since then, I’ve always been a little curious about what it would be like to invite certain people to dinner. So I took a personal interest in this month’s Readers Write question: If you could invite any author, dead or alive, to dinner, who would it be? What would be on the menu? What would you talk about? One of my writer friends took this idea to heart, although, most of the time, she was the author doing the inviting. 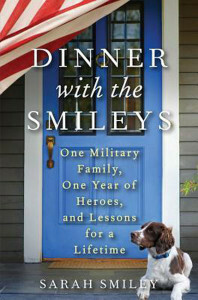 Sarah Smiley, author of Dinner with the Smileys: One Military Family, One Year of Heroes, and Lessons for a Lifetime, decided to fill her Navy husband’s seat at the table for the year he was deployed to Djibouti, Africa. A senator was their first guest, so her sons, then 11, 9, and 5, decided the sky’s the limit and they could invite anyone to dinner, even the U.S. President. Sarah didn’t worry about cleaning her house or making special meals. Lasagna night was lasagna night. Each week, guests entered their real life, complete with preteen angst and sibling rivalry. In her book, Sarah shares their experiences with hundreds of dinner guests—from preschool teacher to professional athlete to cancer survivor—who all came together to help raise her three boys. Her book is about more than lasagna; it’s about love, motherhood, and the importance of community. In fact, the American Legion Auxiliary awarded Sarah the 2014 Public Spirit Award for her positive community impact (this is a big deal – she’s in the company of past recipients Colin Powell and Ronald Reagan). Dinner with the Smileys created a host of comical, embarrassing, educational, heartbreaking, dramatic, awesome, and memorable moments (like the time her youngest, Lindell, mooned the governor—perhaps not Sarah’s proudest mom moment, but gives you just a taste of her humor and endearing vulnerability). The pivotal moment in this dinner idea, the experience that led Sarah to think of writing a book about it, was an unexpected dinner invitation at an assisted living facility near their home. Sarah and the boys had just finished reading to patients and were saying goodbye at the door, when one of the residents invited them to stay for dinner. Before Sarah could answer, her hungry boys were already following Frank to the dining area. Frank told the boys that he and his wife, Anita, had been married 60 years. Anita, who had just been dancing and singing around the room, was painting the table with her pasta sauce. Frank explained that Anita has Alzheimer’s Disease, so she doesn’t remember being married, nor does she remember her five children. When Sarah’s youngest son realized what that meant, he left his seat and crawled into Sarah’s lap. Their experience getting to know Frank and Anita that night changed their lives. 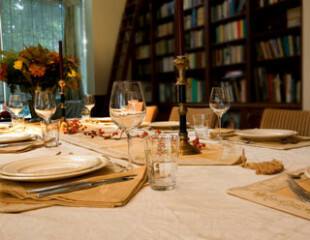 Our Books Make a Difference team posed this month’s question to readers all in fun, but Sarah’s experience says a lot about this notion of dinner invitations. Although her husband has returned, their year of weekly dinner guests has passed, and her book is nearing its paperback release, Sarah is still inviting folks to dinner and still adding to her family’s lifetime of lessons. Rachel: I would want to have dinner with Sylvia Plath. I would want to talk about what it was like being a mother, an artist, and an intellectual. There are definitely moments in my life when I can understand her urge to give up–being a mother on top of everything else can feel so overwhelming. I would be interested in what her support systems were like (or the lack thereof), so that we could try to find out how to be both mother and professional intellectual. And also, we’d eat steamed Brussels sprouts. Just because. Kegan: CS Lewis… We would eat filet mignon, asparagus, and French onion soup. I would say nothing at all… I would just listen the whole meal. That would be awesome. Natasha: Mitch Albom. Nothing fancy, just burgers or Mexican food. I would like to talk about how he writes and about his books. I wonder if they are all based on truth or just some. Kristel: Iris Johansen because she is my husband’s favorite. I would cook steak and potatoes. We would talk about how she came up with her book ideas. Melissa: Virginia Woolf. I don’t know quite what we’d talk about. I’d just love to see what she’d be like in conversation. We’d have wine with dinner and sit a while in the garden afterward. Nelly: Mark Twain, BBQ ribs (on a steamboat), and we’d talk about whether or not the world has changed for better or worse. Nicole: Madeleine L’Engle. I’d be too excited to eat, but we’d most certainly have tea and shortbread cookies. After I got through my thousand thoughts surrounding A Circle of Quiet alone, I’d get to the heart of matters and ask her outright what she did with the guilt of writing while raising a large family and running a business. Because writing takes you away from something…how did she throw her whole heart into it in the short bursts of time she would set aside for it? Vanessa: Isabel Allende. I would excitedly tell her how the themes of her novels shaped my Spanish Literature class conversations and ask what it meant to become one of the first successful female novelists in Latin America. I would also ask how her own experiences, in addition to the experiences of other women in Latin American culture and society, came to be reflected in her novels and what that symbolized and meant for her generation. And we would probably eat fine Chilean cuisine with fine Chilean wine. Christian: Garrison Keillor or Terry Pratchett. The conversation would be a riot. How about you? Let us listen in on your dinner conversation with the author of your choice from any time period. Post your dinner invitation or a recap of your evening. Karen Pavlicin-Fragnito grew up in a home where family dinner was a place for laughter, conversation, and once in a while, some very interesting guests. She grows apples and writes fairy tales about what happens with the rotten ones… Edward and Adam please RSVP directly to Karen. This article was first published May 2014.